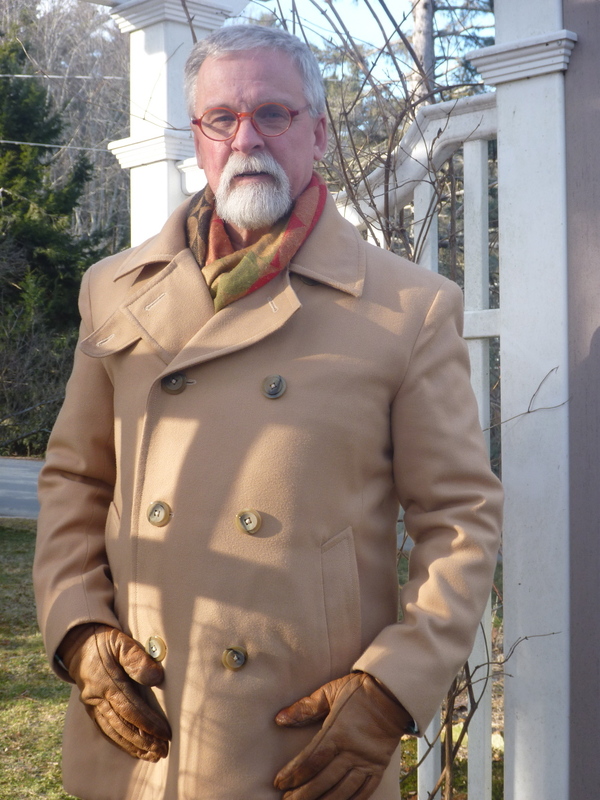 The “not so much wool” pea coat is finished! 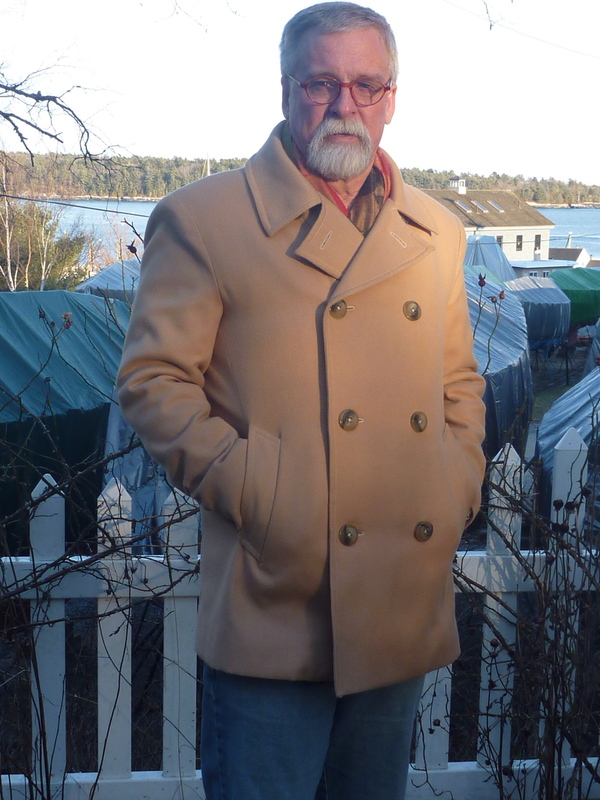 It was 8 degrees here in Maine today, so I’m wearing a flannel shirt, wool sweater and scarf under the coat. On a day like today I’m very glad I decided to add the flannel underlining to the back. I think it really made a difference. Here is the back view. I’m pleased with the fit across the shoulders, and thankful that there’s enough room for a few extra layers underneath it all. 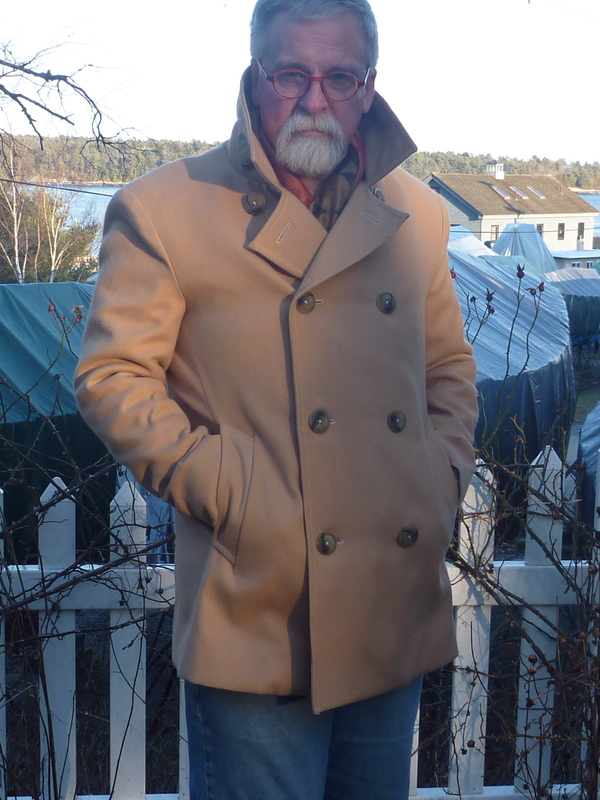 So completes the Japanese pea coat. I think I’ll be getting a lot of use from this coat. 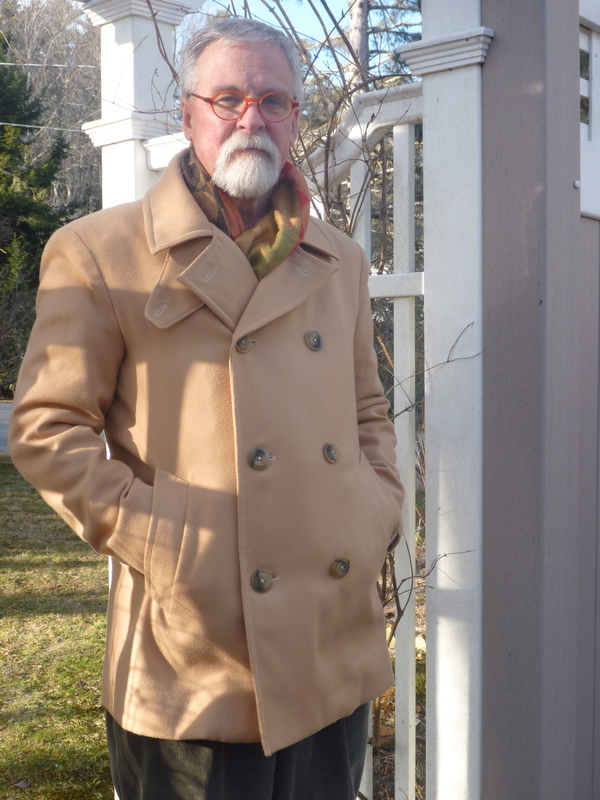 Up until now I’ve been wearing my frock coat (which I LOVE), but our weather has been unusually warm. Sooner or later reality has to strike. When it does, this will be my “go to” coat. At this point I’ve completed all 4 of the designs in the Japanese coat book. Last year I thought I was just making a toggle coat, and look what happened! I hope that my experiences will encourage other amateur sewist to tackle outerwear and tailoring. Truly, if I can do it, anyone can. Duane, it looks wonderful. Great job — and stay warm! 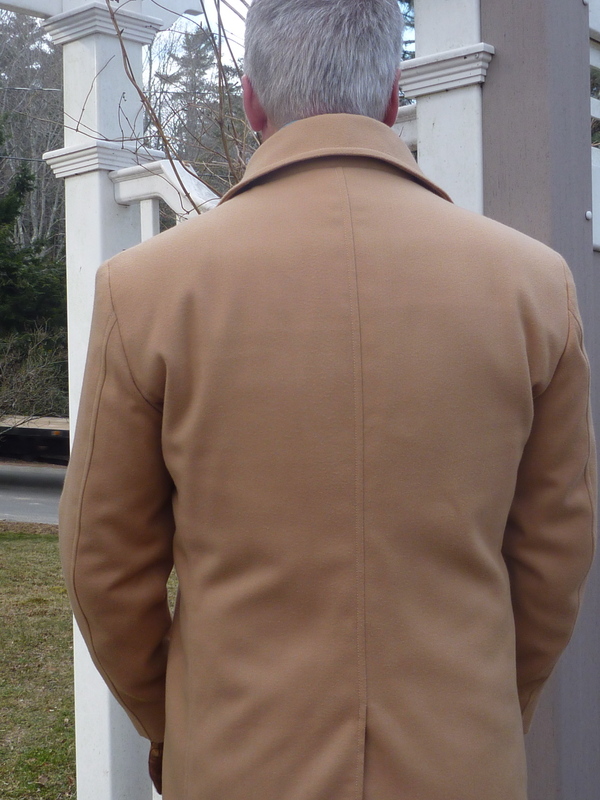 That coat is just fabulous – fit, style and finishing. Health to wear. Nothing like a wool coat with a big collar. Great job. You could've actually worn that coat in Florida today. It was 31 degrees as I headed out this morning. Then again, that's probably balmy to a Mainer like you. The coat is wonderful, fits great, and looks fabulous on you! Well done! I can't think of a good enough word to describe your coat. It is beautiful and the fit looks fantastic. Bravo to you! oh my goodness, you are all kinds of awesome. i'm attempting my first tailoring right now, and am crazy intimidated by the things i don't know. good job! How beautiful! And you look strikingly handsome in that colour. Wonderful job! Well done! Beautiful tailoring that fits you wonderfully. An inspiration to the rest of us to keep trying 🙂 Beannachtaí na Nollag na mBan – greetings from Ireland! Congratulations! You have done a wonderful job. I would say I hope you get to wear it loads – but that sounds like I am wishing bad weather on you! This is a very awesome coat! Congratulations! Looks great! The fabric for my coat came in the mail Saturday, a nice dark, olive green color. I will pre-shrink it tonight. I am wondering, is it necessary to preshrink all the other elements too, lining, interfacing, underling? Any advice will be helpful. Thanks! I love finding new blogs, and when I do I go back to the beginning and try to check out how they started ect. I LOVE that you've come so far. You give me hope, I will be back to check out more. Keep sewing! Hi Nashville, I preshrink everything but the polyester lining. According to Roberto Cabreara it's not necessary to shrink the lining. He's my guru, so I follow his advice. You have a great looking coat. I love the color, fit and style. 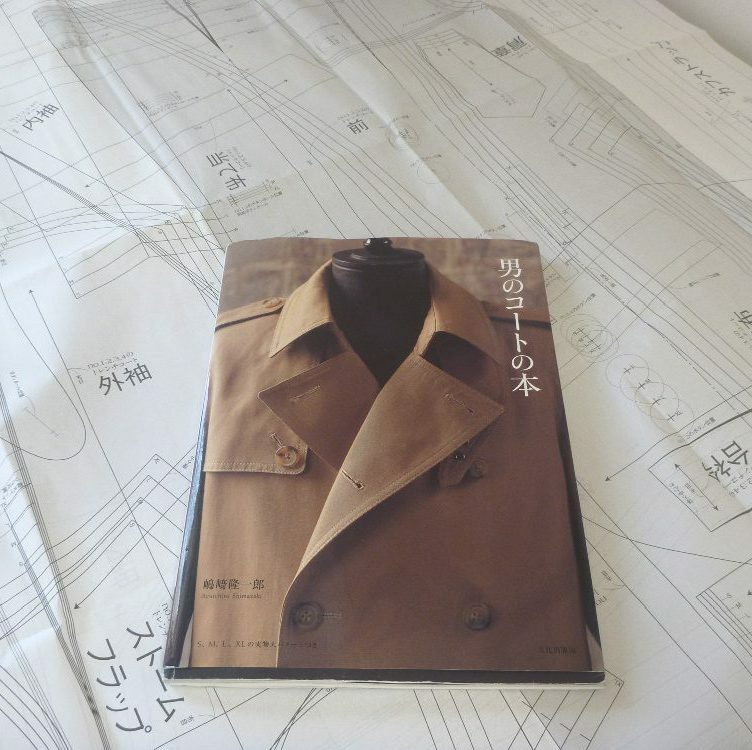 A truly wonderful coat.I keep meaning to learn how to tailor properly and this coat makes me want to do it! Just beautiful! I'm making my husband a pea coat and can't believe who hard it is to find a decent pattern. This one is nice!